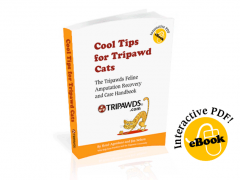 We hope your Tripawd will never experience a life-threatening emergency, but the fact is, 92 percent of dogs will be involved in some kind of medical trauma at least once in their lives. Don’t wait for a tragic medical situation to test your life-saving skills. This free report is written by author Rebecca Prince, and will give you a head-start on knowing what to do during an emergency. The perfect body temperature, heart beat and respiration ranges for your dog and how to check them. The two extremes of temperature, heatstroke and hypothermia. (How you should immediately respond – and what you SHOULDN’T do). What to do if your dog is poisoned (What you need to do- and the WORST thing you can do). Available for just $19.95, Canine-911! is a 124-page resource that can save your dog’s life in emergencies. It’s also a comprehensive guide to your dog’s health, happiness and vitality — without which you could unknowingly cause your beloved pet’s early death. Download Canine-911! today and get a free copy of “Healthy Foods for Healthy Dogs,” which contains over 150 simple recipes, from meals to treats that your dog will love. 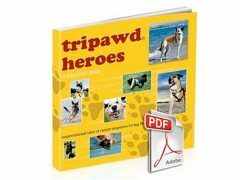 This bonus material normally sells for $29.95 but is yours free when you purchase Canine-911!. Don’t stand by while your pet needlessly suffers during an emergency. Be prepared. Hey thanks for this! Did you hear about Dakota’s overenthusiastic Christmas dinner the other night? I really wondered about the doggie Heimlich, and this will help in case it ever comes up again. OMD no! You need to blog about this! I’m glad he’s OK.